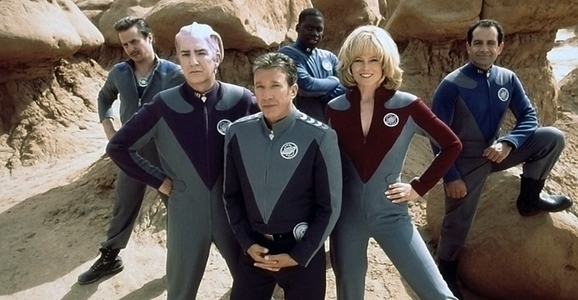 No matter how much we want it to be true, no matter how many reports we hear of a finished script, and even though most, if not all, of the key cast members have said that they’re down, we’re not going to get see Galaxy Quest 2 anytime soon. That’s just a sad fact of life we’re going to have to get used to. We don’t have to like it—if there was any justice in the world the film would have been a massive box office smash and we’d be complaining about too many sequels—but if we spend too much time dwelling on it, we’ll just drive ourselves nuts. That said, we can experience new adventures of the crew of the NSEA Protector, though it is in comic book form, and now you can check out the first few pages of the inaugural issue. Issue number one of the IDW series, Galaxy Quest: The Journey Continues, has finally arrived in comic book stores and various online retailers across the land, and just in case you have any hesitations about picking this up, they’ve released this handful of pages, as well as a couple variant covers. Galaxy Quest never seems to get the credit it deserves. Sure, you’ll be hard pressed to find a science fiction fan who didn’t like it, but, some 15 years after it hit theaters, Galaxy Quest remains a beloved cult classic…but also just a one-off. In this age of sequels and shared cinematic universes, it seems amazing that we never got more Galaxy Quest than we did, even though rumors and whispers about a sequel continue to pop up every now and then. But there’s one Galaxy Quest actor who is just fine with Galaxy Quest being the one and only Galaxy Quest. Despite the fact that he looks like he’s about 15-years-old, Justin Long has had a relatively lengthy, eclectic career. He’s done horror like Drag Me to Hell and Jeepers Creepers, comedy like Accepted and Idiocracy, and even co-starred with Bruce Willis in a freakin’ Die Hard movie. Sure, it was Live Free or Die Hard, but it’s still a Die Hard movie, even if barely. One of our favorite of his 70 credits on IMDb, however, is still his first, 1999’s Galaxy Quest, and it’s one he has fond memories of as well. Long is currently on the promotion path, stumping for his new film, Kevin Smith’s Tusk, which opens this weekend and sees the perpetually youthful thespian surgically turned into a walrus. (This premise calls to mind two things, one, The Human Centipede, and that episode of South Park where Kyle’s dad is surgically transformed into a dolphin.) As part of his tour, he did an Ask Me Anything session on Reddit, and as things tend to do on the Internet, the nerdier component too over, and talk soon turned to Galaxy Quest and the possibility of a Galaxy Quest 2. 15 years ago, a strange little movie called Galaxy Quest opened in theaters. A spoof of maybe the most beloved single television show in history, Star Trek, Dean Parisot’s film was a moderate hit at the box office, but has become a fan favorite over the years. It was even voted as the 7th best Trek movie by attendees at a recent convention, beating out the like of Star Trek Into Darkness, Generations, and even the first motion picture in the franchise. 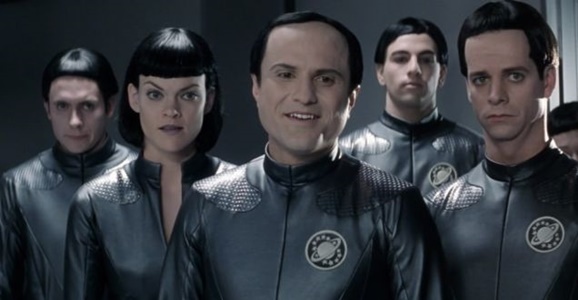 There has been sporadic talk about Galaxy Quest 2 from time to time—the adventure of the crew of the NSEA Protector will actually be continued in comic book form—but one of the stars insists that there was in fact a finished script at one point. By Grabthar’s Hammer, Galaxy Quest To Continue As A Comic Book Series! In a perfect world, Galaxy Quest would have been a massive box-office hit and spawned a run of sequels that continue to this day. Alas, ours is not a perfect world, so instead the brilliant sci-fi comedy earned a mere $90 million worldwide and settled in for the long haul as a legitimate cult classic. 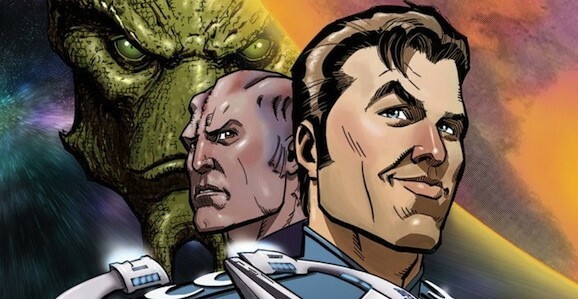 While we probably won’t get to see the further adventures of the NSEA Protector up on the big screen, there is some freshly announced good news: IDW Publishing has announced an upcoming Galaxy Quest comic book series! Daylight savings time is here. It’s getting dark sooner, so there’s no point in going outside, right? All you want to do anyway is get inside to stream this particularly awesome assortment of sci-fi fare. And even if you’re too busy farming, you can just watch something on your mobile device. A love-it-or-hate-it film that will probably see more adoration on this website than others, Buckaroo Banzai is a cult classic in the purest form. 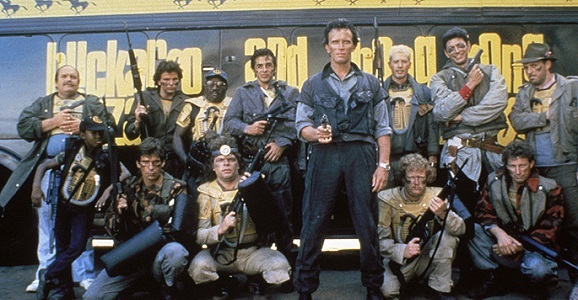 With a plot that involves Peter Weller’s surgeon/physicist/rock star bringing aliens into the world and having to destroy them, along with a high-grade bunch of ragtags, this is a mindbender of the highest order. There are maybe five minutes in this movie that aren’t driven by badass imagination and wackiness, but even those are damn awesome. We still somehow never got to see Banzai take on the World Crime League, nor did Yakov Smirnoff ever become the National Security Advisor. In present-day America, 8th dimension opens you.